When you think of flooding, your mind naturally goes to summer monsoons. However, a lot of flooding and flooding damage occur during the winter months. The cold can cause leaks and bursts. Ice dams can form on the roof. Large amounts of water are locked away as snow and ice, but melting can release all at once instead of draining properly. This can lead to sudden massive damages to your property, leading to major issues and costly repairs. This article discusses the main causes of winter flooding in your home as well as some tips on how to prevent costly flooding this winter. Pipes that are in cold area of the house like the basement, attic or crawl spaces, are at risk or freezing. Cold water will freeze inside the pipes and lead to pressure buildup that will eventually cause a pipe to burst. To prevent pipes from bursting, insulate pipes in potential freeze areas, seal holes letting cold air into your home, and leave the water on trickling slowly on colder days and nights; the static water keeps the pipes from freezing and bursting. When there’s plenty of snow on your roof, heat from your home will rise into the attic and can cause the snow to melt. This will create a pool of water that will end up being trapped since there is no opening for runoff. The trapped water can back up underneath a roof shingle, continuously melt and then refreeze inside your home. Ice dams that form can cause problems for the roof like rot and growing mold inside the home. Learn more about ice dams and how to remove them from our previous article: Removing Ice Dams and Protecting Your Home. When a snowstorm drops large amounts of snow at once (think 8 inches plus), it will naturally pile up around your home. This is fine until it begins to melt. You then have large amounts of water going directly into the ground around the foundation of your home. This is especially dangerous near any basement windows or laundry vents because snowmelt water doesn’t flow along the same channels as traditional rain. Learn more about snowmelts and how to prevent them in our article: Preventing Snowmelt from Flooding of Your Home. Use these tips to help protect your home from winter flooding and water damage. Also, review our article to find additional places in your home to protect: 4 Tips to Keep Your Home Warm and Safe This Winter. When shoveling, take extra time to remove the snow that is closely surrounding your home. Make sure to check your gutter spouts for any damage and clean them regularly. Check your roof for small leaks. These can eventually turn into bigger leaks when snow and ice sit on your roof. Homes with flat roofs are more vulnerable to large amounts of snow collecting. Have a roofer come out to remove the large amounts of snow before it turns into ice. 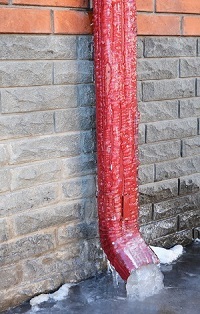 Install a pipe insulation sleeve to protect freezing pipes in your home. Have a sump pump installed in your basement to remove accumulating water. If you don’t have the proper homeowners coverage, these can be costly repair bills. It’s important to document all information and damage done to your home in the event of winter flooding and damage. Still want to learn more about other types of flooding in your home? Contact the experts at TJ Woods and see how we can provide you the best insurance coverage for your home.